The political and religious geography of modern day Jerusalem is complex. An important center to three of the world’s major religions, it can be a dizzying mishmash of faith, culture, religion, and politics. This also makes it arguably the world’s most perpetual political hotspot. I was in Jerusalem near the Western Wall, also known as the “Wailing Wall,” which is located at the base of the Temple Mount. The wall is a section of stones which were part of a retaining wall that supported a large expansion of the temple mount by Herod shorty before the time of Jesus. The Hebrew temple was destroyed by the Romans in 70 A.D. After the muslim conquest of Jerusalem in 637 A.D. the el-Aqsa mosque and Dome of the Rock were built on the site and remain to this day. Political tensions at the time meant that the mosque and Dome of the Rock were closed to non-muslims (though we were grudgingly allowed by muslim authorities to climb an adjacent rooftop and look over the area). The temple, as envisioned by Ezekiel in these final chapters, has never been built as described. This leads many Jewish and Christian teachers to believe that it will, someday, be built. At one end of the Western Wall complex is a visitor’s center which is dedicated to planning for and the rebuilding of the temple once again. Many Christian scholars read the breadth of eschatological (study of the end times) material and believe that the temple will be rebuilt before the end in fulfillment of what has been written. I stood at the Western Wall among a throng of Jews and Christians, looking up at the muslim complex which towers above it, and the stairway (blocked and barricaded at the time) that leads up to the temple mount. It was hard for me to fathom a shift in the political and religious stalemate which would allow for the rebuilding of a Jewish temple. This leads me back to the mystifying subject of prophecy and the end times. I have come to understand that prophetic visions, dreams, and metaphors are layered with meaning, and it can be almost impossible to see and clearly comprehend all the layers. This morning I have more questions than answers as it relates to these things and confess that the on-going textual blueprint of Ezekiel’s temple vision seems to hold very little meaning for my Monday or the week ahead. And so, I am thankful for the chance to visit Jerusalem and gain personal context for these things. I am trusting that all things will work together towards prescribed times and events. And, I am praying that I may not be so distracted by theological rabbit trails that I neglect more important matters of fulfilling the command to love God with all I’ve got, and to love others as I love myself. After being away too long, I am back. Today’s chapter and its complete attention to detail left me thinking about those who dismiss the Old Testament and its connection to the New. 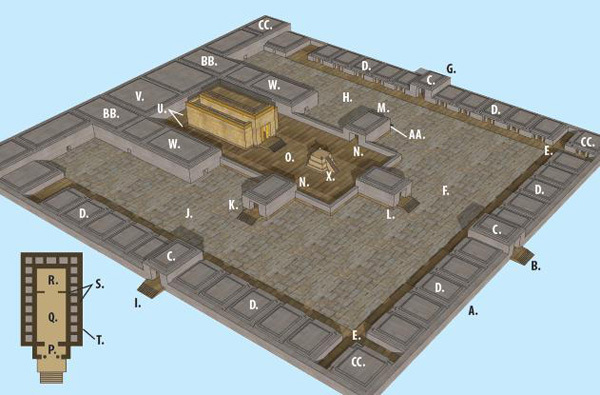 I am amazed at all the specific requirements that the temple plans included and that there was purpose in its design. I also think about the history of the place being described and all the conflict both religious and political that has and is happening there. I know you Tom and my parents have traveled there and it gives you a totally different understanding of the Scriptures. It hasn’t been on my bucket list, but maybe it should be.